One of the most cherished times for a new mother is rocking their new baby to sleep. For every nursery, its nice to have a glider chair not just for getting your baby to fall asleep in your arms but it makes those nightly feeding times a little bit easier. 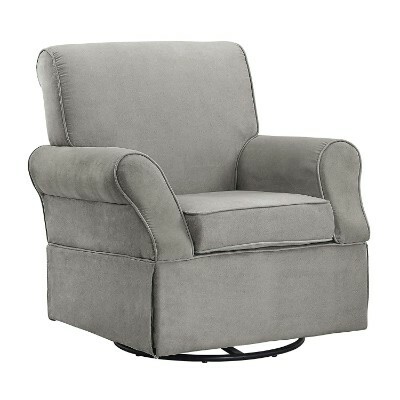 We have a wonderful selection of the best glider chairs for your newest bundle of joy. There’s a little something on our top ten list that’s suitable for every nursery. You’ll be falling asleep with your baby in your arms comfortably with these gliders. Take a look at our top ten list below and you will find exactly what you’re looking for. Gliders are a wonderful way for you and your baby to bond during those special feeding times. They are also a wonderful way to help get your baby to sleep on those restless nights. Our top ten list has the highest rated gliders that the market has to offer for 2019. We also converted this buying guide to our new format. 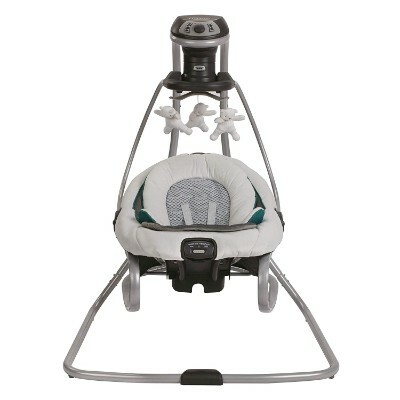 This lightweight swing and glider offer so much to you and your baby. Weighing just over twenty-two pounds and capable of supporting a maximum of twenty it has the ability to be moved easily from space to space. It’s a priceless feeling to know, no matter what needs to be done there is never any worry that your baby’s far from you. It plays ten engaging and relaxing melodies and songs. In addition, it plays five sounds from nature, to provide your baby with a calming environment. There is no bedding required and the body insert is machine washable. It is made of water resistant material so parents won't have to worry about any kind of stains. This sweet glider swing can be used as both a sleeper and a place for your baby to hang out during the day. This glider is easy to transport weighing just over twenty-two pounds. There is a three-point harness designed to provide your baby with an incredibly safe place to rest. There is a timer so you can easily set the sounds and vibrations to fit your needs. There are six motion speeds and two vibration speeds so you easily customize the right amount of motion for your little one. 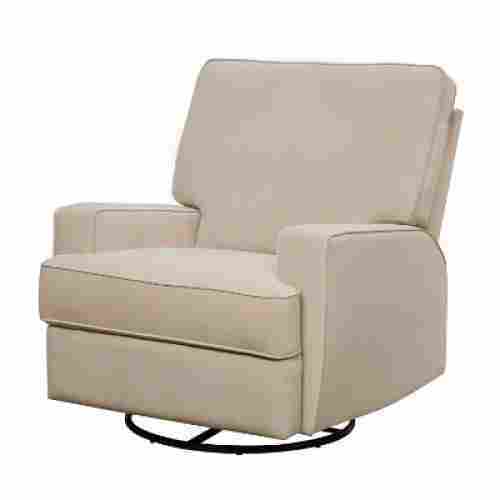 Parenting can be exhausting, so sit back and relax with the DaVinci Swivel Glider. While you’re at it, prop your feet up on the included ottoman. The metal base allows you to glide and rock smoothly in the chair without making any noise. You won’t have to worry about a stressful setup process as this chair arrives fully assembled. The polyester fabric is easy to clean, which is especially great if you choose a lighter color of fabric for your chair. When purchasing you can choose between four colors to fit the style of your nursery. Grey with cream piping, Dark grey with dark grey piping, cream, and dark grey with cream piping are the available color options. Whatever color you choose, we’re confident that it will look great next to your baby’s crib. The polyester fabric is super soft and durable. You will be just as cozy as your baby as you rock them to sleep. 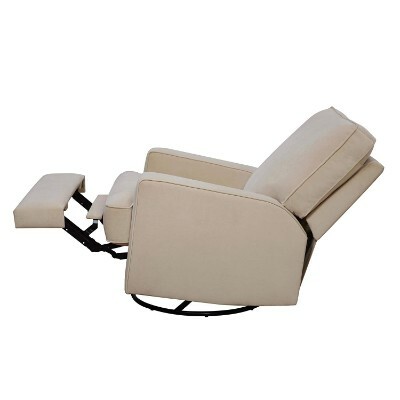 The high back allows you to rest comfortably without hurting your neck. The lumbar pillow provides extra support to your lower back so you can enjoy sitting in this chair for long periods of time. The ottoman is a great addition to this chair as it allows you to fully get comfortable. Designed with a high back and a lumbar pillow this chair supports your whole body while providing a little extra support to your lower back. This swing, made of premium fabrics, can also double as a rocker. There is a removable headpiece for easy cleanup. The headpiece is extra plush and padded to give your baby the most in comfort. It plays five sounds and melodies. The black and white contrast is great for baby’s stimulation and development. The black and white patterns feature an adorable floral design, with a touch of contemporary style. The pretty pink flower toys included are a great addition to add just a hint of color without overdoing it. The removable rocker makes it compact and easy to transport. It takes up little floor space and your baby can easily go with you wherever you need to be. There is a five point harness to give your baby the most in safety. There are four swing speeds to choose from so you can help ensure your baby has the best possible experience. The headrest fabric is removable for easy cleanup. 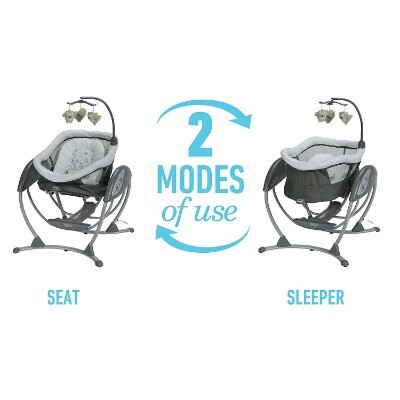 There are two vibration speeds to choose from to find the right motion for your baby. 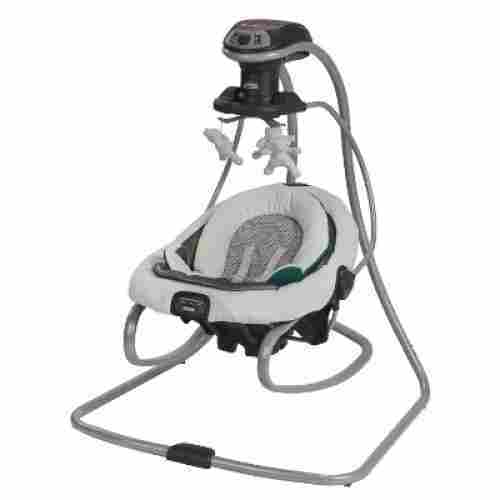 The rocker can support up to nineteen pounds while the swing is capable of supporting up to around thirty pounds. This microfiber glider chair comes with a matching ottoman. It's made of microfiber material and swivels as well. It comes in three different gender-neutral colors: beige, a dark chocolate brown, or a grey. This chair comes with a swivel function and comes with a wooden frame making it long lasting and durable. It also comes with a matching ottoman so that there’s a place where you can rest your feet and kick back and relax during those feeding times. The cushion is padded with a thick material making it extra soft for you to enjoy. It does recline, so you’re able to lean back and enjoy those peaceful moments with your little ray of sunshine. This chair is so soft that it’s perfect for those feeding and snuggling times with your new baby. 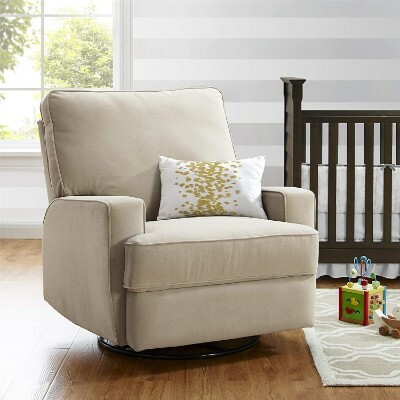 The Babyletto Madison Swivel Glider will add a touch of elegance and sophistication to your nursery without compromising the safety of your baby. 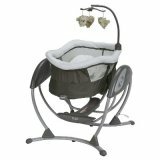 The chair glides smoothly and gently which will allow you to rock your baby to sleep in minutes. It is perfect for small nurseries as it does not take up much space. The chair is available in ecru, mocha, and slate. With the elegant look of this chair, you will be able to use it long after your child grows out of the nursing and rocking phase. While the chair won’t take up much space in your nursery, you will have plenty of room when sitting in it. In fact, you can even use a nursing pillow while sitting in the chair without feeling squished. Designed with a rounded back, this chair will give your body the support it needs while you sit in it. The metal base is equipped with a 360-degree swivel motion and does not creak. 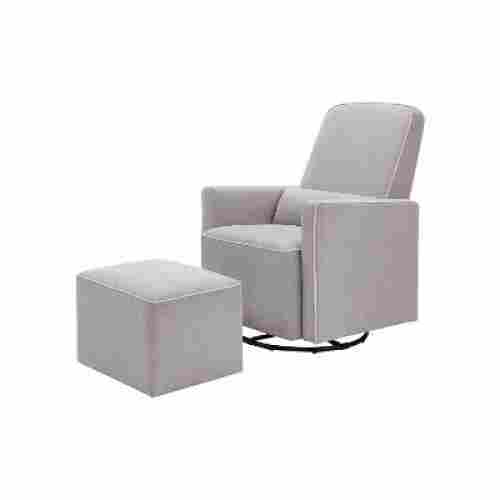 If you have been using your office chair to swirl or swivel around when you are tired, perhaps your baby can also find some degree of comfort in the Mikayla Upholstered Swivel Gliding Recliner. 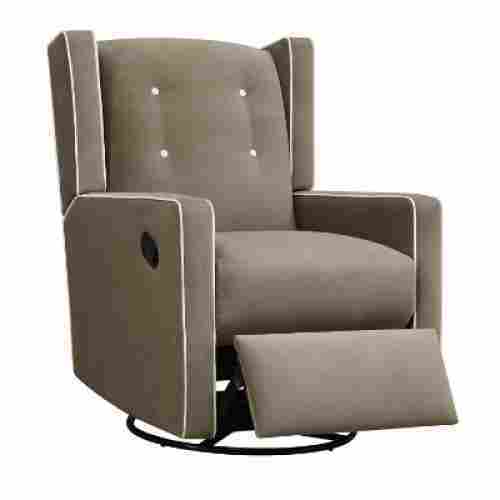 This upholstered glider chair has a fully integrated ball bearing mechanism that has been engineered to work as a swivel and as a glider. The ball bearings are fully encased in a precision-engineered housing to provide you with unparalleled smoothness of gliding and superb rotation of its swivel function. The Mikayla doesn’t have an ottoman to rest your legs and feet but it does have leg rest that can be easily pulled out and up from Mikayla’s recliner. The Mikayla comes in different colors of gray linen, gray microfiber, and mocha microfiber, all of which have the same white welt details to provide superb contrast. There’s also button tufting as well as a seat that is filled with spring core foam. 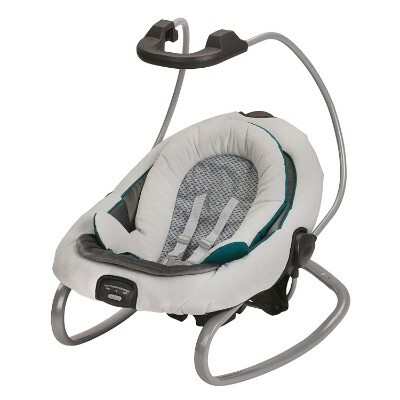 The circular base is made of high-grade steel to help keep the center of gravity always in the middle whether the Mikayla baby glider is in the upright sitting position or in the reclined position. Best of all, this circular base is what provides stability for the glider rocker especially when you do decide to swivel it around. The thick cushiony seats provide you with ample comfort and warmth. 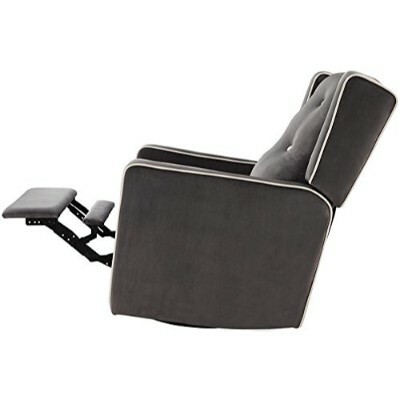 It swivels and reclines giving you a range of motion options. The easy to pull mechanism included on the side make it incredibly easy to maneuver. It is easy to assemble providing you with a hassle-free setup process. The three neutral colors can be selected and paired to go with any decor. The Mikayla is one fantastic nursery glider. 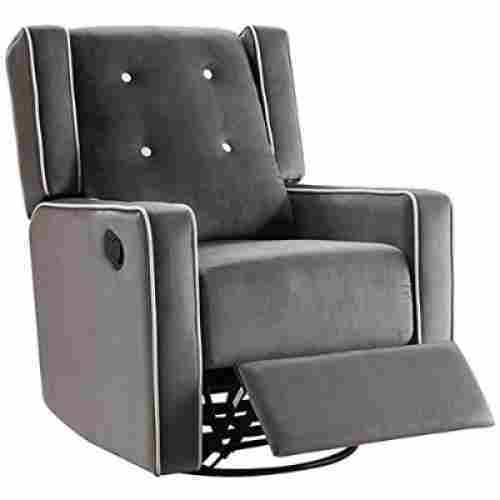 Its multifunctionality – chair, recliner, swivel chair – proves to be one of its strongest points. The technology put into its construction is also phenomenal. 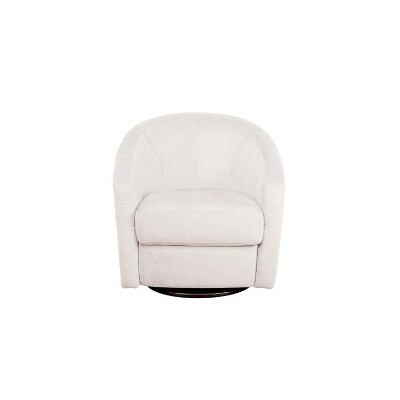 Glide or rock with the Naomi Home Odelia Swivel chair. 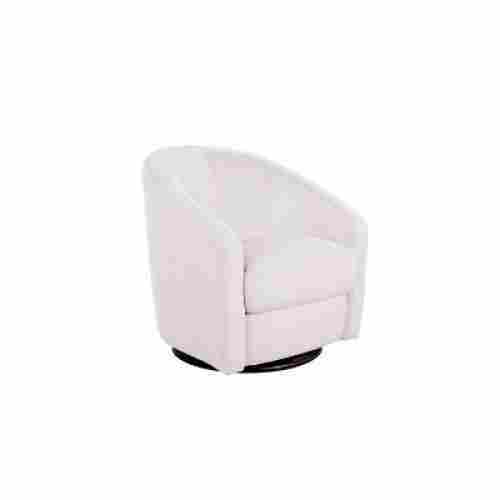 The square silhouette of the chair will add a classy and stylish look to your child’s nursery. The button tufting and the white trim enhance the overall look. While sitting in the chair, you have the ability to turn 360 degrees and recline 135 degrees. When purchasing, you can choose between a variety of neutral colors that will fit your style. The microfiber fabric will provide a soft and plush feeling against your body as you relax. The seat cushion is filled with foam to increase its level of comfort. 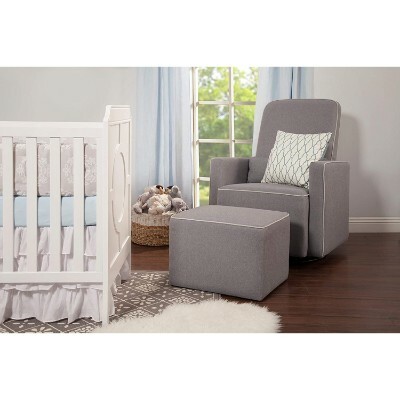 The Baby Relax Rylan glider gives you the perfect space to relax while bonding with your baby. With the square back pillow, you can lean back comfortably while providing full support to your back. When you’re lounging in the chair by yourself and you’re not holding your baby, use the armrests to relax those tired arms. Designed with an enclosed ball bearing, the chair has the ability to rotate 360 degrees and will glide smoothly. Not only does this chair allow you to glide and swivel but you are also able to recline. 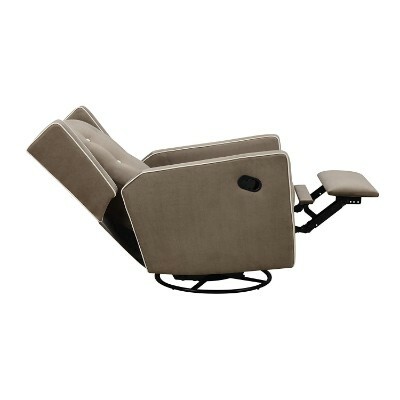 Use the easy-pull reclining mechanism to recline. The super-soft fabric will tease you with the idea of staying in the chair forever. When purchasing, you can choose between beige or grey upholstery to better match the decor in your child’s nursery. With the reclining handle mechanism tucking into the seat it will be out of sight, but still easily accessible. The super-soft fabric, extra padding, and overall design of the chair will provide full support to your body while you relax comfortably. 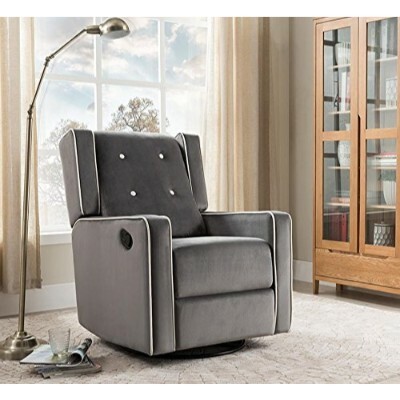 One look at the Brisbane Glider and Ottoman Set and we knew right away that this can rank well in the best glider chair category. 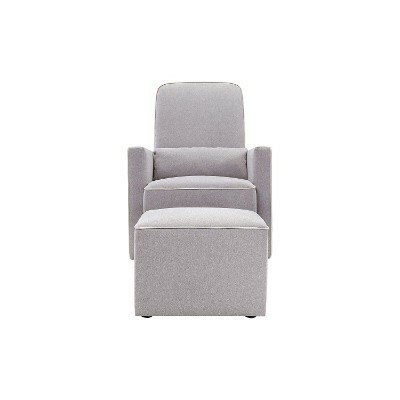 For those who are not familiar with a baby glider, they may actually think that the Brisbane is one beautiful piece of furniture with it's rounded and super plush backrest, fully padded armrests and seat cushion, and a beautiful ottoman to match. The frame of the Brisbane is made of high-quality wood and finished in white to give it that classic Hamptons style of furniture. The Brisbane is also available in 6 different colors and styles so there should be one that fits into your baby’s nursery perfectly. The seat cushion is filled with 100 percent polyurethane foam and covered in pure polyester fabric. This makes it superbly easy to clean. This chair comes in seven neutral and earthy tones to fit into any room or decor. The plush padded are cushions and large seating area make this a great selection for all those possibly sleepless nights. This classic design is not only aesthetically pleasing but capable of supporting up to two hundred and fifty pounds. 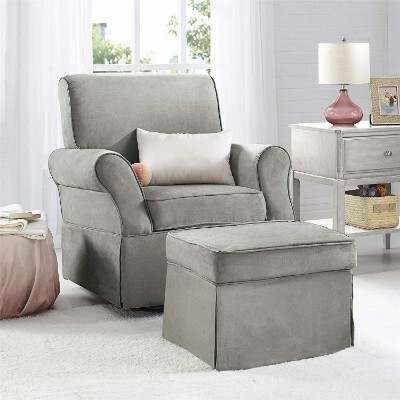 With an ottoman included it is easy to tie together any nursery or baby’s room. Countless nights during the first year of your baby’s life will be spent, most likely, getting very little sleep and possibly feeling like you’re going to lose your mind. Fussy babies can often be particular about their positioning. More importantly, when you’re sleep-deprived, being in a plush and comfortable position can often make things seem a bit more manageable. Comfort and safety are the most important factors when making a purchase like a rocking chair or glider, followed by style. Rocking chairs are great for making memories as your little one gets older. Bestowing wisdom upon them, reading to them, singing together, these are all great ways to create lifelong memories. These chairs provide a perfectly cozy environment to promote snuggles and laughter. On the other hand, there are options to provide your baby with a more independent approach. You are your baby’s protector. In taking that role seriously, it seems highly unlikely that you would be comfortable buying something for your baby if you haven’t been assured it’s safe. When searching for a rocking chair or glider you want to know you are getting something that is strong and sturdy. The frame of most of these is made of solid wood or metal providing you with ample support and stability. With minimal assembly required, you are sure to be provided with all you could possibly hope for out of a rocking chair. As much as you love snuggles, sometimes growing an extra hand seems to be the only solution for getting anything accomplished. Being able to put your baby down for a nap or even for a minute while you put groceries away is often an act we struggle to perform. Oftentimes it makes the difference between feeling like you have it all together and being moments away from losing it. While some babies don’t mind those solitary moments, most babies aren't very accommodating of the milk and groceries that easily spoil. For moments like these, there are a few options provided on this list that are great for providing baby a safe and comforting place to rest. To help soothe your baby or engage their auditory senses, there is a range of melodies and sounds to choose from. The vibrate and swing options simulate the feeling of comfort they receive being safely rocked in your arms. 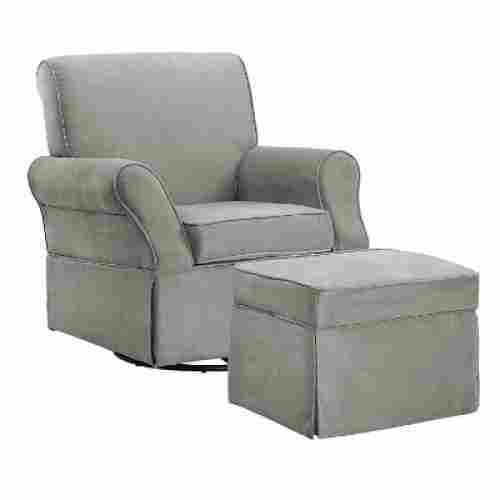 The rockers, recliners, and gliders on this list have plush, generously stuffed cushions to provide the most in comfort. The large seating area provides you with plenty of room to position yourself and baby in an effort to help make it easier to put your baby to sleep. Babies have a number of needs that keep them from sleeping through the night for a solid eight hours. You know your baby isn’t hungry or wet. You’ve checked they’re not too hot or cold. Most likely at this point, your baby is simply looking to snuggle with you while in motion. You want to know you are being provided with the most in comfort, for who knows how many hours will be spent in this chair. 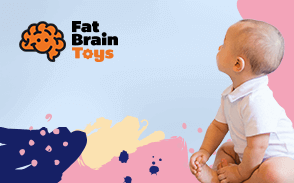 Rocking and vibrating your baby can often simulate the movement experienced within the womb. For this reason, recreating those motions, can be very soothing and calming for your baby. There always seems to be so much going on around us everywhere we go and babies can often and easily, become overwhelmed. Gently rocking your baby can help them to relax and unwind. This, in turn, can often lower their stimulation level and help to drift off to sleep easily. Aside from the sturdy frame, we also had to look at the level of comfort provided by this furniture. Unfortunately, we cannot test each and every single one of these so we had to rely on the comments or feedback of customers. While we recognize the subjective nature of customer feedback, we nevertheless came up with thematic documentation of the responses to identify commonly occurring themes in all of the customer reviews. This gives us an idea of whether the product we are considering including on our list can provide the level of comfort that we know mothers would like to have. Once the issue of safety and comfort has been addressed, we then moved on to the ease of maintenance. It should be noted that you will be sitting on this chair with your baby on your chest. It is inadvertent that your little one may regurgitate or spit, drool, or even leak from his or her diapers. These bodily fluids can stain even the most expensive glider rocker. As such, it is imperative that we also choose these types of furniture according to how easy they can be cleaned as well as maintained. There’s an ongoing debate as to which between a baby rocker and an infant glider is better. To answer this, it is often important to look at the similarities and differences. For starters, both gliders and rockers aim to simulate the rhythmic movements that babies felt while they were still in their mother’s wombs. Mimicking these movements after birth helps them make the successful transition into post-uterine life. This is also the reason why gentle rocking or minute vibrations have also been shown to help infants make the transition while also soothing them in the process. So, which should you choose? It actually depends on you. Gliders and rockers can really benefit both you and your baby especially if you know what you’re looking to buy. Now it is important to understand that you should always choose a glider that has a very sturdy and stable base. This is very important as any imbalance in the glider’s center of gravity can result in falls. It’s alright if it’s only you who will get injured; you have your baby in your arms as well. Additionally, the risk of falling asleep while on the glider is high. If this happens, your baby might slip off your arms and fall. That is why it is always advisable not to use the glider if you yourself are sleepy. Better use your baby’s crib instead. Baby gliders are great tools to help you soothe your baby and help him or her make the successful transition from life inside your womb to one in the real world. This Christmas, get your baby the best glider chair in our top 10 list. q: How will these be helpful for soothing my baby to sleep? There are many benefits to having a rocking chair, swing or glider around the house. They can simulate the same motion experienced during the months spent in the womb. q: Do the electric options come with a plug for the wall? Yes, they provide the option to be both battery-operated and plugged into the wall to provide power. q: What do these products weigh? They range in weight from around 20 pounds to roughly 60 pounds. q: Are there style/color choices? Yes, almost all of these come with at least two options but most come with several more. There are boy/girl choices as well as gender-neutral colors so you are sure to find something to match any motif. q: What is the maximum weight limit for these products? Some, specifically the options designed just for baby, are meant to max out at around 20 pounds. The larger rockers and gliders max out at around 230 pounds. q: Are they difficult to assemble? Are all the pieces included that are required for assembly? Most require very minimal assembly. All of these come with everything needed for assembly, helping to reinforce an easy and hassle-free experience. q: Are these made of safe, environmentally friendly materials? Most of these are made of wood with microfiber or polyester cushions.